Premarkets lost their fleeting momentum Tuesday and were headed lower, a day after sinking into the red for the year as highly volatile growth stocks took another beating. Investor sentiment has turned fearful over the past week on rising concern that some valuations have become stretched at a time of modest earnings growth. U.S. stock futures for the major indexes were mostly lower, with their tentative early morning gains slipping away. U.S. stocks closed in the red Monday for a third consecutive day. The Nasdaq closed down more than 1% after sliding a combined 3.6% on Thursday and Friday. The Dow and S&P 500 also fell more than 1%. All three major U.S. stock indexes are now negative for the year. In corporate news Tuesday, Alcoa (AA) will report first-quarter results after the closing bell, the first major company to do so. 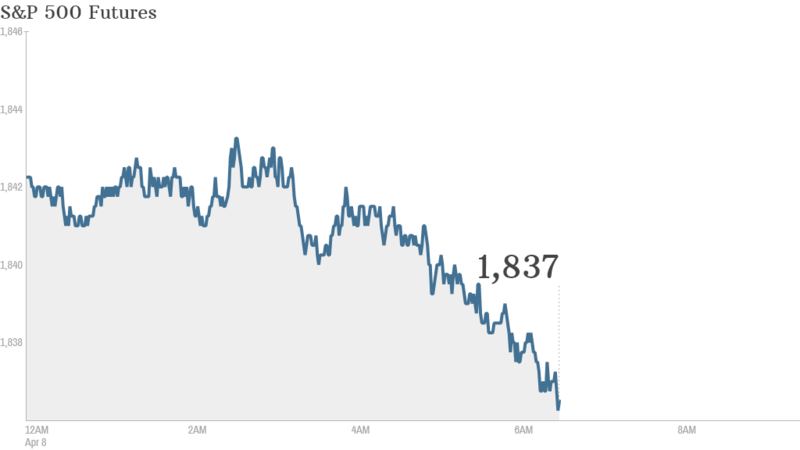 European markets were falling, erasing earlier narrow gains, as tensions arose again in Ukraine. Russia's Foreign Ministry warned Kiev on Tuesday that use of force in the eastern region could lead to civil war. Asian markets were mixed Tuesday. Tokyo's Nikkei fell 1.4% as the central bank ended a policy meeting without any hint of further economic stimulus. China's benchmark Shanghai Composite index rose 1.9%. Chinese markets, which were closed Monday for a holiday, have been supported by hopes the government will take steps to boost faltering growth.